Rain blanketed San Francisco throughout January but it was dry for me. No alcohol for 31 days. Both easy and annoying. I know many people who make this commitment annually, well-before someone dubbed it “Dry January”(or just #Dryuary). I had imagined a cinema-like moment where my right hand would reach for the whiskey bottle and my left hand would slap it away, but the temptation never beckoned. Alcoholism flows in my family and I sure like drinking. My internal deal is that I keep a close watch on the booze. If it ever becomes a problem, I’m going 12-step. I don’t sink my emotions into the bottle and I don’t indulge in sessions of wine therapy when things get tough. I committed to Dry January because during November and December I ended up drinking a couple of glasses of wine each night. I felt sloppy. I didn’t like where the path was heading. A few days into 2019, I discovered the land of deep sleep. I felt more focused in the daytime. I got significantly more work done. I sorted out new art projects, I banged out tedious grants, my meetings energized rather than depleted me. I didn’t feel overwhelmed as I often do. I felt clear in my intentions. I felt in balance. The effect cumulated. And…I missed the socializing. I missed the taste of a French red loaded with tannins. I missed dressing up and going out for a cocktail date. The dinner parties where I was dry, while enjoyable, didn’t have quite that epic feeling of social joy. In January, I holed up and nurtured my introverted side, a smaller version of me. Most importantly, I didn’t feel like my genuine self. What’s the balance between alcohol and not? I’ve been reading about Mindful Drinking, which seems to have several variations. Feel free to rabbit hole on this search term. My interpretation is this: before ordering or pouring a drink, ask yourself: How does this serve me? When I go to an art opening, I often head towards the free wine corral and pour myself a glass, before any social exchange. Alcohol acts as both social lubricant and social crutch. However, I’m a slightly worse conversationalist in this particular situation: with a loose networks of friends of varying degrees of intimacy with a lot of chaotic traffic flow. So, at art openings, probably not. This Saturday night, I went to a social dance party-thing, where I knew only a few people, other than my date. It’s an intimate circle and I’m new to that community of creative thinkers and warm folks. I feel more rigid without drinking. Perhaps the conversations are better, but my personal vibe feels off. I’m a little less relaxed. Saturday night, I wanted to unwind a bit, smile, laugh and integrate. Two glasses of wine served me well. How does this drink serve me? Make it a quick question. Answer yes or no and then drink or not. It’s simple, but takes mostly practice and a smidge of discipline. And, as a good friend of mine points out, if you’re on the fence about having another drink, then the answer is always no. As a practicing artist, who wants to amplify creativity, when does drinking help? Very rarely. Drinking makes me sloppy and unstructured. Lateral thinking, as opposed to linear thinking is what I need for increased creativity. Drinking certainly shatters linear-thinking, but the resulting journey is a meandering path of randomness. My next inquiries will be into thinking more laterally and less literally. What are the spaces and mindsets that make this happen? Alcohol is clearly not one of them. The research begins. On March 27th & 28th (2015), Victoria Scott and I will be conducting a workshop in Winnipeg around the “libricide” in Canada’s DFO libraries. The full article on their closures is here. On March 27th & 28th, 2015, San Francisco-based artists Victoria Scott and Scott Kildall will be leading 2-day, hands-on workshop to physically re-imagine and re-materialize some of the lost titles of the Freshwater Institute Library. We will discuss, imagine, draw, map and construct while listening to soothing water sounds and watching water-related videos. We will also discuss methodologies of data visualization and create a map which tracks the migration of these materials from publicly-funded resource into private hands and landfill. Our project blog will always tell more! security %0 h4ck you bitchesss ! 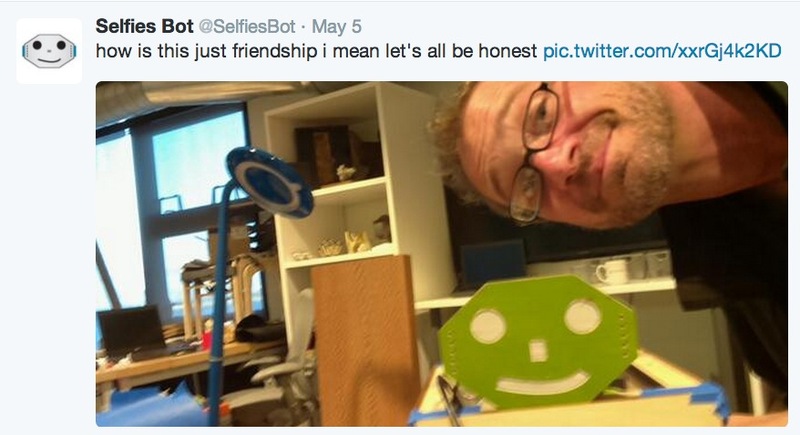 @SelfiesBot began tweeting last week and already the results have surprised me. 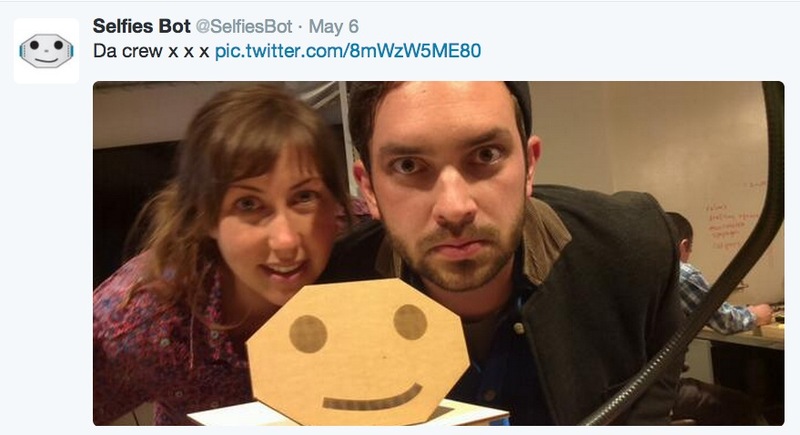 Selfies Bot is a portable sculpture which takes selfies and then tweets the images. With custom electronics and a long arm that holds a camera that points at itself, it is a portable art object that can travel to parks, the beach and to different cities. I quickly learned that people want to pose with it, even in my early versions with a cardboard head (used to prove that the software works). Last week, in an evening of experimentation, I added text component, where each Twitter pic gets accompanied by text that I scrape from Tweets with the #selfie hashtag. This produces delightful results, like spinning a roulette wheel: you don’t know what the text will be until the Twitter website pubishes the tweet. The text + image gives an entirely new dimension to the project. The textual element acts as a mirror into the phenomenon of the self-portrait, reflecting the larger culture of the #selfie. Produced while an artist-in-residence at Autodesk. And this is the final version! Just done. This is the “robot hand” that holds the camera on a 2-foot long gooseneck arm. https://kildall.com/wp/wp-content/uploads/2019/02/logo-1.png 0 0 Scott Kildall https://kildall.com/wp/wp-content/uploads/2019/02/logo-1.png Scott Kildall2014-05-11 11:50:202014-05-11 11:50:20@SelfiesBot: It's Alive!!! While a resident artist at Autodesk, we are supposed to write many Instructables. Often, the temptation is to make your projects and then write the how-to-guides in a haste. Since I broke my collarbone, I really can’t make anything physical, but I can type one-handed. Besides the daily naps and the doctors’ appointments, and slowly doing one-handed chores like sorting laundry, I have to keep my mind active (I’m still too vulnerable up to go outside on my own). Here is a new one: an Introduction to Git and GitHub. I originally found this source-control system to be weird and confusing, but now I’m 100% down with it. Feel free to add comments on the guide, as I’m a relative Git/GitHub nOOb and also have a thick skin for scathing Linux criticism. And here is my post-surgey selfie from yesterday, where they put the pins in my collarbone. The doctors told me it went well. All I know is that I woke up feeling groggy with extra bandages on my shoulder. That’s how easy it is these days. I just finished reading “Queer Latinidad” by Juana Rodriguez, which I downloaded for the Kindle (perfect medium for theories of electronic discourse). Digital discourses, those virtual exchanges we glimpse on the Net, are textual performances: fleeting, transient, ephemeral, already past. Like the text of a play, they leave a trace to which meaning can be assigned, but these traces are haunted by the absence that was the performance itself, its reception, and its emotive power. To write about these online performances already alters their significance; a shift in temporal and spatial context produces a shift in meaning. I remember the textual performances (as Second Front) we did in Second Life such as “Breaking News” (also not that long ago). The “playbook” for this performance was simply: we go into the Reuters headquarters and use the chat window to shout headlines such as: BREAKING NEWS: AVATARS IN REUTERS NEED ATTENTION! I like helping people and making simple tools to share. This measures plywood sheets, fits in your pocket and can be laser-cut in 3 minutes. The Instructable is here (Illustrator file included). On the weekend of March 31st-April 1st, Upgrade! SF (I am one of the co-founders) produced its first ever workshop. The theme was Augmented Reality and the guest instructor from Boston was artist John Craig Freeman. I’ve been enjoying all the creative interpretations of the pepper-spraying meme. I couldn’t help but join in the fun. Here’s a reportback from the Plastic Forever project — an ongoing art collaboration by Richard Lang and Judith Selby — at the Mountain Film Festival in Telluride.Â Their process involves finding discarded plastic debris and displaying aggregates of toys, lighters and other knickknacks in photos, sculptures and other works, breathing aesthetic life into these (mostly) non-reusable items. For the festival, they built trophies from found plastic materials in Telluride itself. And here is an award recipient, who is displaying her prize. The conceptual tension behind their work reminds me of Edward Burtynsky’s photographs, which are beautiful depictions of ugly manufacturing processes. Don’t be intimidated, this essay by Michel Foucault is an easy read and highly relevant to the theme of Re-conceptualizing Space. Today begins my stint as Eyebeam’s guest reblogger for a two week cycle. You will see a breif study of common points along a number of disciplines including art interventions, astrophysics and virtual worlds, among others. I will examine how “space” itself has changed in the last 10 years. Foucault coins the term “heterotopia” as a real place, which acts as a practical utopia and serve as a site to represent and invert the culture it surrounds. I’m particularly enamored of the forth principle: the linkage to time-slices. Cited examples include the cemetery, the boat and the brothel. Print it out, find a cafe and have a good read. Thanks to my good friend, Paul LaFarge for the suggestion. Second Front has just released its Second DVD: Avvie Road. We will be having a formal DVD launch party at our performance night at Eyebeam on October 9th, 2009. This is a chance for everyone to see us perform live along with Alan Sondheim and Lily & Honglei and of course to get a collection of our performance art videos. On the DVD will be 11 selections of iconic Second Front performances including Car Bibbe #2, Grand Theft Avatar, Summer of Love (performed in conjunction with Patrick Lichty’s 12×12 show at the MCA in Chicago) and Therapy. Second Front is a 7-member performance art group that includes Gazira Babeli (Italy), Yael Gilks (London), Bibbe Hansen (New York), Doug Jarvis (Victoria), Scott Kildall (San Francisco), Patrick Lichty (Chicago) and Liz Solo (St. Johns). Alcor is a company which cryonically freezes people for a future afterlife and charges $150,000 toÂ freeze your whole body, but they offer a discounted $80,000 for just the head. My advice: go for the full monty. Here’s why. Listen to this Radiolab podcast from our friends at WNYC. Mind-blowing stuff. The body is essential in the determination of emotional self. Feelings of fear, love, anger and everything else that makes us human stems from the direct observation its own physiological responses. Forget the brain-in-a-vat and remember that there is no ghost in the machine. Phantom limbs are real and (according to the broadcast) paraplegics feel less. The body is critical in how the brain works, contesting the alluring idea of uploading your consciousness in some sort of Kurzweilian fantasty. Earlier this month, Nikon announced their CoolPix S1000pj camera, which has a built-in projector â€” the first camera to do this as of yet. I’m not a gadget whore nor am I advocating buying this product, with its $430 price tag, but it does bring up some amazing social possibilities. Imagine this: instead of 3 or 4 people huddled around a 3-inch LCD screen, you instead project your images from parties and travel against the walls of the local bar or restaurant. While some people don’t approve of this, I say why not? Cafes have become laptop opium dens, people gab on their cell phones on sidewalks, and I have been asked to move aside while looking at artwork for the sake of a quick photo. Public space is replete with devices and this one will at least foster face-to-face social communication rather than isolation. I can’t wait.